Standing with fair director and TTU geography professor Peter Li are (left to right) Blake Shepherd, Brazton Neeley and Hailee Eklund. Abigail Ferrel is not pictured. 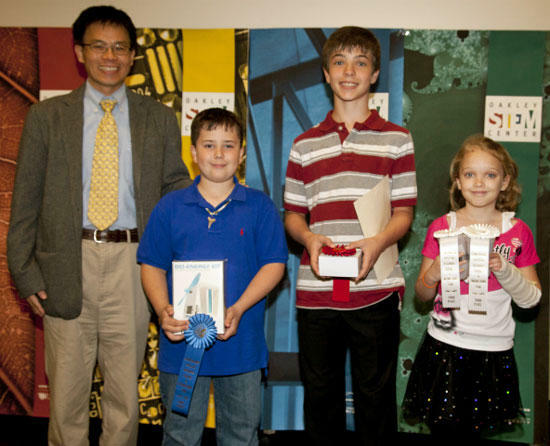 Nearly 100 competitors representing grades 4 through 12 participated in the 58th annual Cumberland Plateau Regional Science and Engineering Fair this spring at the Millard Oakley STEM Center at Tennessee Tech University. The students were from more than 10 counties. Blake Shepherd of Cookeville’s Northeast Elementary took first place in the biological category of the intermediate division, which includes grades 4 through 6. Second place went to Braxton Neeley of Cornerstone Elementary in Baxter and third went to Hailee Eklund and Abigail Ferrel of Woodbury Grammar School.